I'm a bit late with my monthly "what I'm into" post because of vacation but here we are, in the midst of September already! I'm so ready for cooler weather, apples picking, cozy sweaters, and pumpkin baked goods of all sorts! While on vacation we watched Jumanji: Welcome to the Jungle, which was quite fun! Otherwise, we've just been watching Parks and Recreation on Netflix because it's short and funny (and we love Ron Swanson). I just finished my latest Flavia de Luce novel on audio and the kids and I are listening to The Yearling by Marjorie Rawlings together for our homeschool bookclub. I remember absolutely loving that book when I was younger. 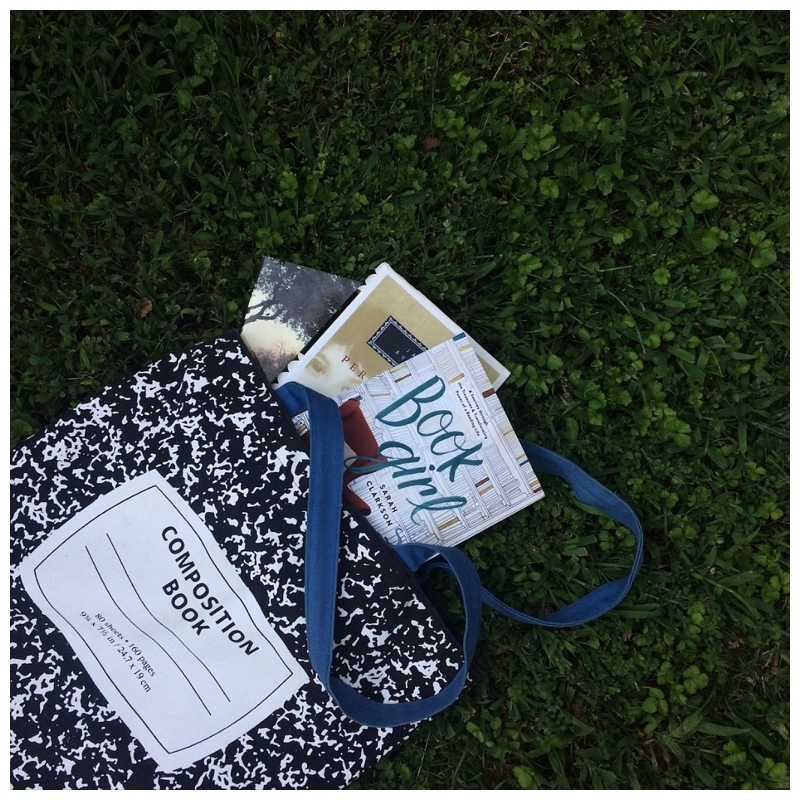 I just finished Sarah Clarkson's delightful and inspiring Book Girl and added some good books on my to-read list for fall. Most of them are older books, as opposed to newer, and I can't wait to dive into some Elizabeth Goudge and Rumer Godden. 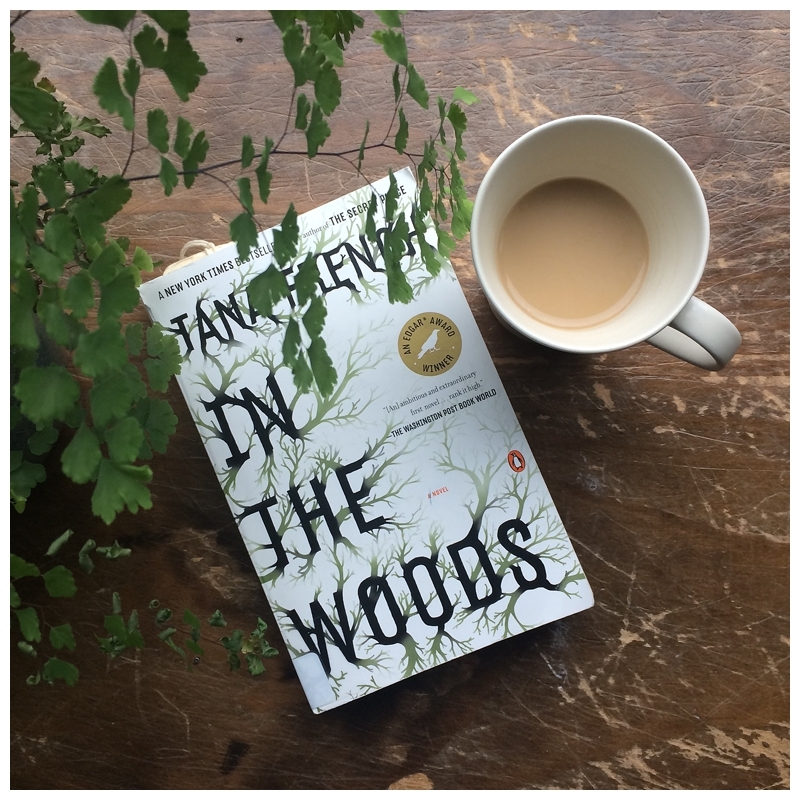 Over vacation I was looking for a fast-paced thriller and really loved The Likeness by Tana French. The premise was on the unbelievable side, but I could suspend belief because the story was so intriguing. I’m also reading Not By Sight by Jon Bloom. I’m reading it as a devotional—reading the scripture he notes at the beginning, then reading the short chapter that corresponds each morning. The writing is fresh and vivid, breathing life into familiar stories. These Smashed Sweet Potatoes were so delicious as were a batch of Pumpkin Spice Granola. I also made a batch of our favorite Quinoa Muffins (I use cranberries) for breakfast/snacks this week. They are tasty with a hint of sweetness and so filling! I must confess I've not read many books on homeschooling, partially because I was homeschooled myself, loved it, and had a great experience, so I never went through a "research" phase to determine if it was something I wanted to do or not. But this time of year I am deeply thinking and planning about our upcoming academic year, and I find myself returning to some books again and again, as well as discovering some new favorites. One book that I read almost annually is Sarah Mackenzie's Teaching from Rest: A Homeschooler's Guide to Unshakeable Peace. 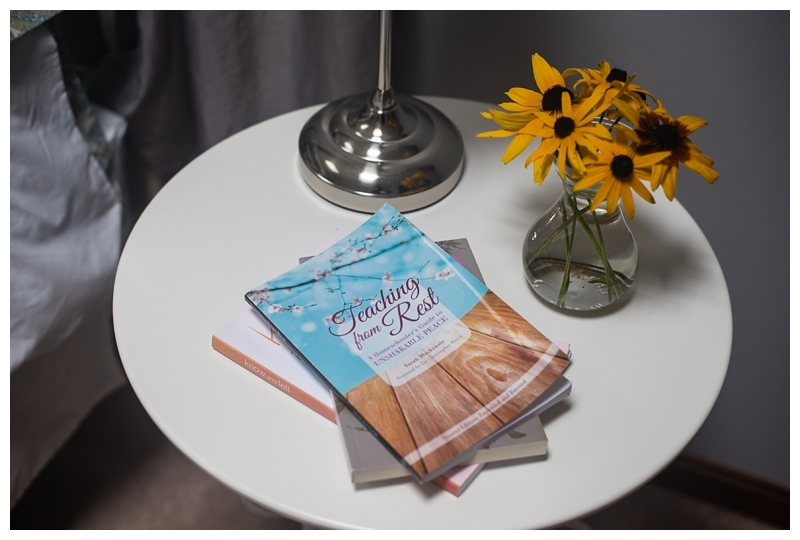 This is a slim volume that is full of wisdom, encouragement, and practical suggestions. This book introduced me to loop scheduling, using a "time budget," and choosing a literary mentor to guide my reading through the year. I'm currently really loving the influence of Cindy Rollins. First, I read her book Mere Motherhood: Morning Times, Nursery Rhymes, and My Journey Towards Sanctification. It's really more of a memoir than anything else, but filled with so much goodness that includes what she did right--and wrong--told in a conversational way with a side of sarcasm. I've also become a Patron of her podcast, and am literally sitting down and taking notes of the exclusive content I've received by joining here. Know and Tell: The Art of Narration by Karen Glass is a book I wish had been written several years ago when I was just starting this homeschool journey. It has cleared up all my questions having children narrate ("tell back") the material that is read to them (or they read) either orally or in written form. Since my boys struggled so much with reading/writing due to dyslexia we have not been consistent in this area, but this book has helped me as I plan for this year. There is even a chapter on narrations and learning challenges, so there is much to consider in this wonderful book. I will also be implementing some of the content from the "narration in the classroom" chapter in my co-op class this year. What is your favorite homeschooling book? Or, if you don't homeschool, a book that has impacted your educational philosophy or parenting style? I'm very excited to share that an essay I wrote about my life as a homeschooled student has been featured in Wild + Free's most recent subscriber bundle, Wander. 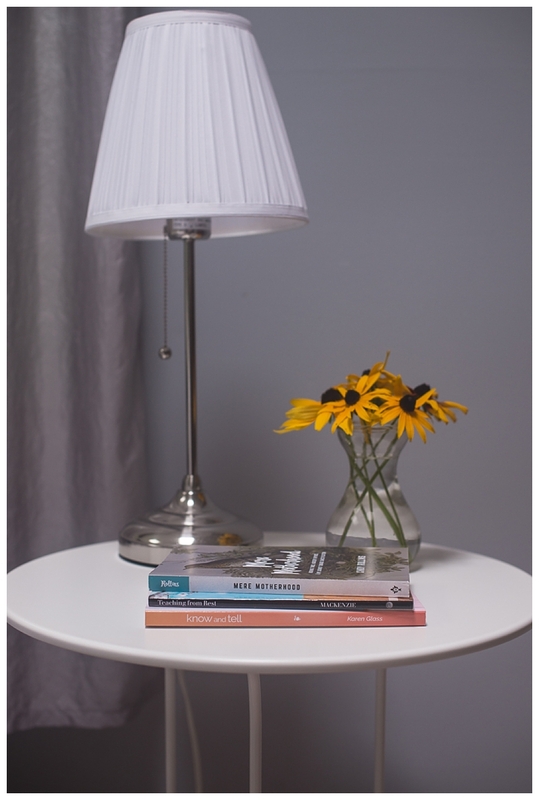 Wild + Free is a beautiful homeschool community. I have benefitted from their conferences, digital bundles, Instagram, and podcast. I was thrilled to write about one of the most treasured memories from my days as a homeschooled student when my mom read to my siblings and me after lunch. I couldn’t wait to find out what would happen next to my favorite character, while being transported to another time or place by the power of Mom’s voice. These books were dubbed 'family books,' and we continued to read aloud together even long after I was old enough to read on my own. The power of the audible voice captured any wanderings of my mind, making the stories dance off the page and into my imagination. 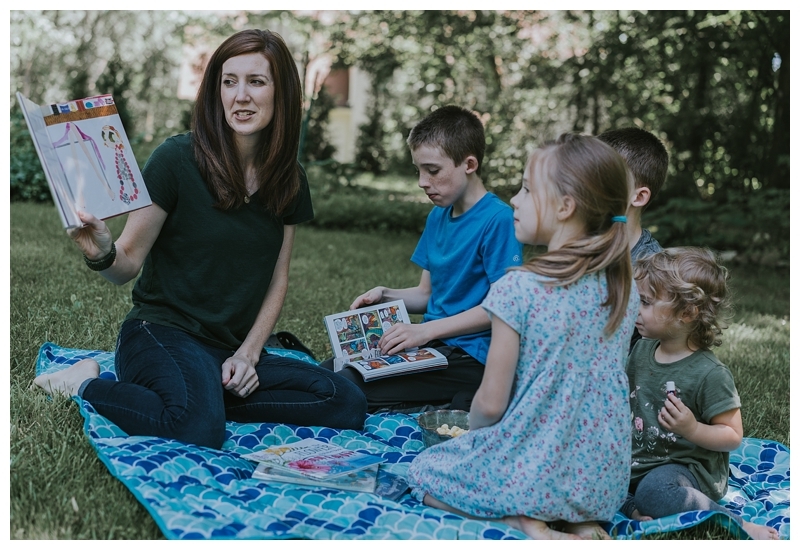 To illustrate this article, my friend Molly Balint of The Farmhouse Creative photographed our own read-aloud moments. It's so special to have these images, not just for the article, but to treasure and document our days. I also got to chat with Jennifer Pepito about reading aloud as a family and how to know whether we're doing too much or enough in the podcast portion of the bundle. July is almost over (can you believe it!) and since I wasn't able to post in June I have a nice round up of favorite things for you this month. We've been watching When Calls the Heart for all five seasons as a family because it's a clean show the kids enjoy. Kind of reminds me of Christy or Dr. Quinn, Medicine Woman, remember those? Season five, however, ended in a very un-Hallmark manner with a shocker that left the kids in tears! What!?! Definitely will be interested in what plays out next season! I still am enjoying Father Brown on Netflix. It's my laundry-folding show and it's a comfort that the bad guys are always caught and the mysteries are tidily solved each episode. I've become a Patron of Cindy Rollins' podcast, The Mason Jar and am enjoying the exclusive content from her site. I am literally taking notes, the content is just that good. Also, I just finished the fourth book in Alan Bradley's charming Flavia de Luce series. I adore them on audio. I don't know anyone else personally who has read them, however Cindy Rollins and Jen Hatmaker are fans. I was really happy to hear Jen rave about them on a recent episode of What Should I Read Next. These books really need more people to discover them! I've read some good books lately, one of my favorites was this psychological thriller I Found You. Caveats include strong language and an especially icky assault scene, but overall I just couldn't put it down. Can't wait to try more of her books. A Murder for the Books has been a fun cozy type of mystery. Think a Hallmark movie in book form, so at times, it verges on cheesy, but a nice summer-type of read. Parenting Is Your Highest Calling: And 8 Myths That Trap Us in Worry and Guilt was one of the best parenting books I've ever read. Seriously, there's not many more books you need to read besides this one. It was my first introduction to Leslie Leyland Fields, but I definitely plan to read more of her work! I picked two books this summer to be my "professional development" to help me become a better homeschool parent to my kids. 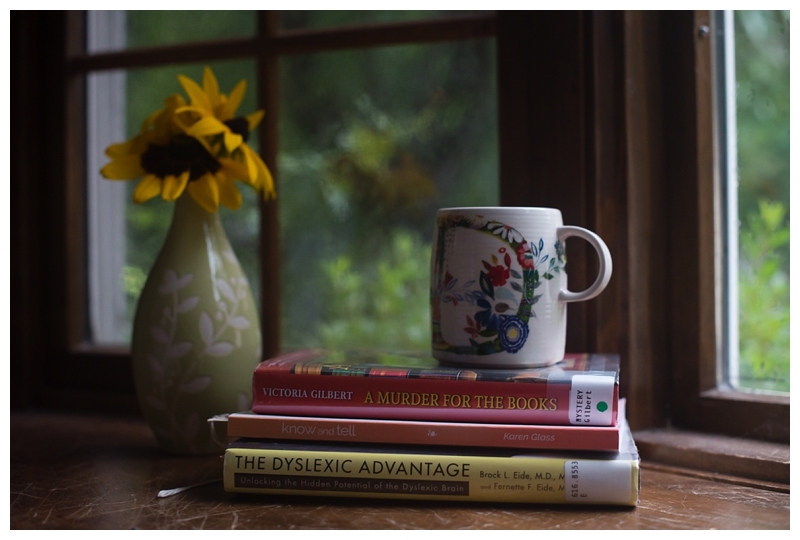 The first title, The Dyslexic Advantage: Unlocking the Hidden Potential of the Dyslexic Brain has been hugely helpful and encouraging as I look to more year helping the boys thrive not only in spite of, but because of, their dyslexia. The other is Know and Tell: The Art of Narration by Karen Glass which I'm busy highlighting. It will be helpful in not only our narrations at home, but as I teach a Writing and Rhetoric class at our local co-op. I made these Stuffed Sweet Peppers (by one of my favorite Instagrammers) for a party and man, were they delish! Also easy, which is always a plus. The other night we also tried these Korean BBQ Burritos which were quite tasty and had a unique blend of flavors. My daughter is my mini-me. She spends her days drawing and writing books. When I say she writes books, I means she truly is crafting books just like I did when I used to create slightly plagiarized versions of Beatrix Potter's stories. She folds and staples the pages together to make the cover and pages for the inside of her latest title. Maybe "Fitz Learns to Swim" or "The Lost Tea Cup," which have been two of her latest endeavors. You can imagine her excitement when I bought her these. And so, I think it's important to encourage her imagination not just with quality art products and quality literature, but also the stories of women who've gone on before her. Women who were once girls and were equally enchanted by stories and scribbled away with ink and feathered pens. 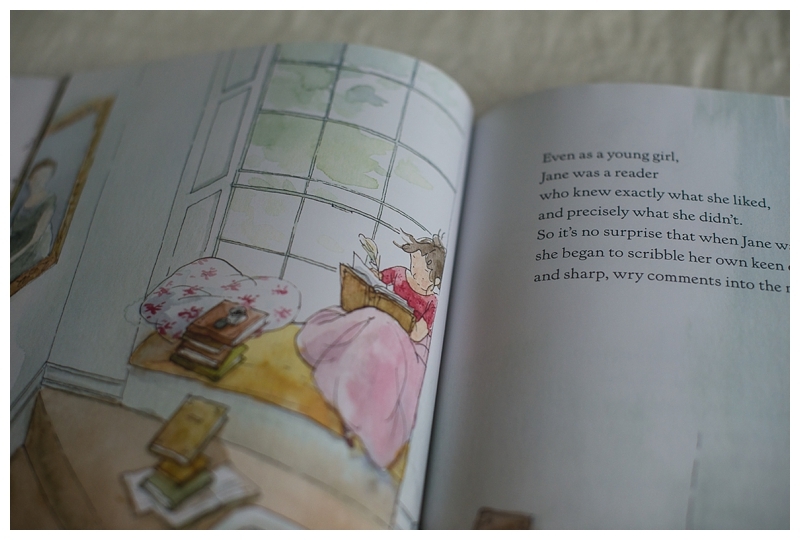 So today, I'm rounding up some of my favorite picture books about literary ladies to share with you, just in case you have your own authoress in the making. 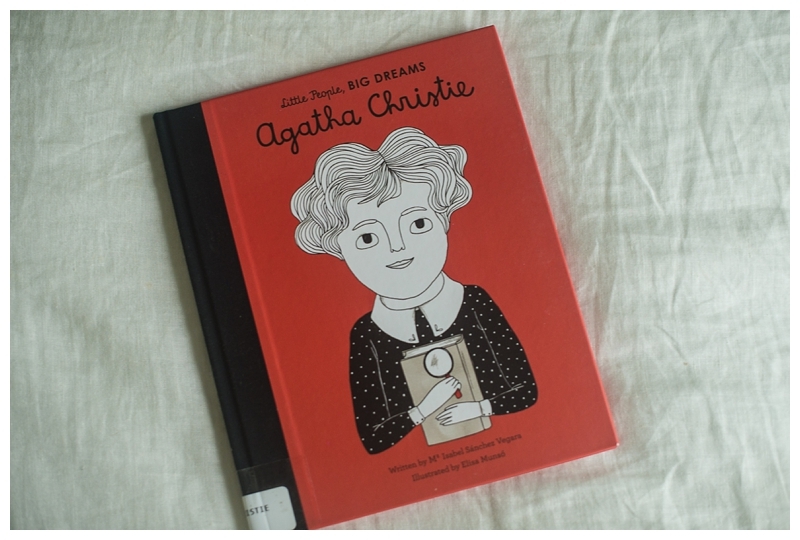 The Little People, Big Dreams series is delightful and I was so pleased to find Agatha Christie's biography included. We discover how she became something of an expert at poisons (as a nurse during W.W. I) and how she came to develop her famous sleuths, Poirot and Miss Marple. When Montgomery rediscovers an old manuscript that she had tucked into a hatbox, little does she know it will be the making of her career. Anne of Green Gables is such a favorite book and TV series it's wonderful for kids to find out the "story behind the story" and where the idea came from, as well as more about Montgomery's life. 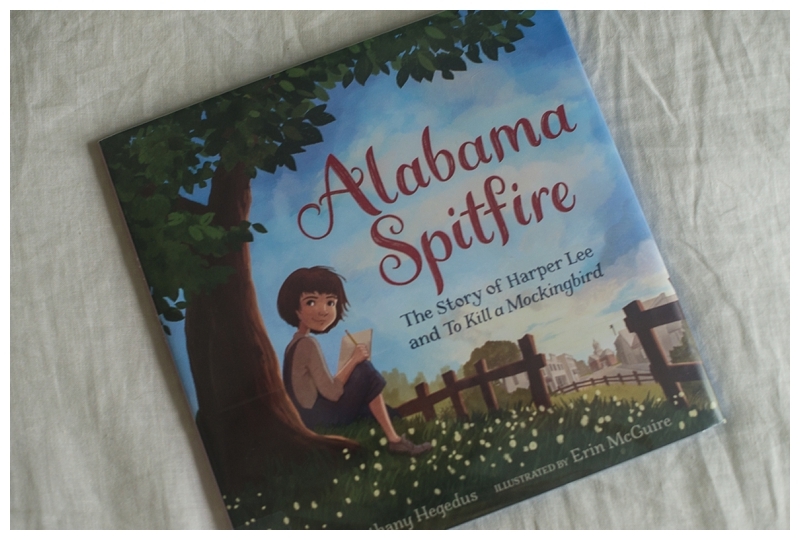 Harper Lee is somewhat of a literary mystery. She withdrew from any sort of publicity after To Kill A Mockingbird and kept to herself the rest of her life. 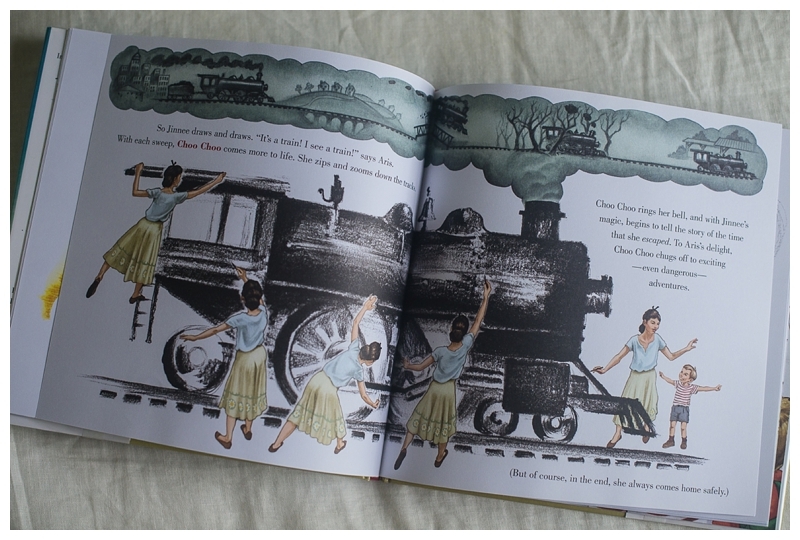 I really enjoyed this picture book and the wonderful illustrations. I didn't realize how much the characters mirrored her own life. My favorite little tidbit the book shares is that Lee and Truman Capote, as children, took turns dictating stories to each other while the other typed them out. Deborah Hopkinson is the queen of biographical picture books, so you will find more than one title by her on this list. 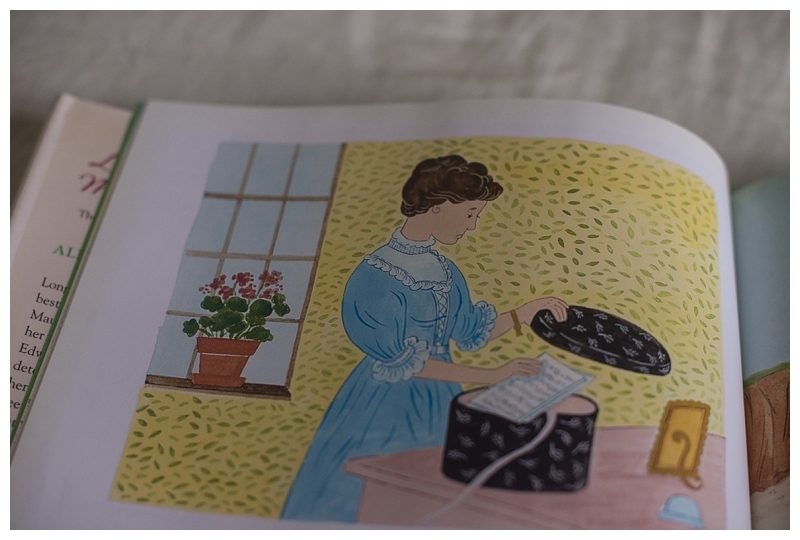 This new book about the life of Jane Austen is made even more charming by the ink and watercolor illustrations of Qin Leng. My boys loved all of Virginia Lee Burton's books when they were little. Anything that had big machines in it inspired interest. Also, Mike Mulligan and His Steam Shovel was one of the first books we bought them, because it was also one of the few picture book my husband remembers and loved. This a lovely whimsical story that shares how Burton's two boys inspired her interest in picture book writing. I had no idea she was already an accomplished artist and dancer too! Before Beatrix was a famous children's book author she was just a girl who loved to draw animals. Charmingly told, this is the mostly true story of how she borrowed an guinea pig and it all went terribly wrong. Today I'm sharing what I've been into this month. My reading slump in fiction kind of continues, but everything else was great! We watched a new Agatha Christie adaptation of the novel The Crooked House on Amazon Prime. I must admit at first it was a bit of a snooze, maybe the first twenty minutes or so. I might have been tempted to give up, if it wasn't that I knew Agatha Christie would deliver. And she sure did! The end was quite a shock as you figure out what's about to happen! Ever since we saw The Greatest Showman we've been listening to the soundtrack. We all love it. It's so cute to listen to Ava sing, "every night I lie in bed, the brightest colors fill my head . . . "
Since my last post I've read Rules of Civility by Amor Towles and The Keeper of Lost Things by Ruth Hogan. Both were "meh" to me. The writing was great by Towles and the concept of the story was interesting by Hogan but I just couldn't love the characters or get caught up in the story. I am listening to the next Flavia mystery on audio, however, and am enjoying it greatly! I'm really loving the characters and setting in this series and the author really captures the time period. I'm sure a lot of research goes into these books but it never feels that way. We've been eating some really yummy stuff. A friend texted me this recipe for a white pizza and we've made it twice. These Greek Lamb Meatballs with Green Goddess Dressing were amazing! I used ground beef instead of lamb and couscous and got my Green Goddess Dressing from Trader Joe's. Also, strangely enough while getting oral laser surgery done the doctor's office had the Pioneer Woman's show on and she made these Cherry Pie Cookie Bars while my mouth was open and numb. They also made my mouth water and immediately went home and bookmarked the recipe and later made it. It was such a easy but delicious recipe that can easily feed a crowd. The orange zest really makes it! If you love history and literature, this is for you! Totally fascinating history. Also, creating a dictionary makes my head spin! This book is NEEDED in America right now more than ever. And the work Bryan Stevenson is doing is incredible. Stevenson's non-profit works to challenge wrongful convictions, as well on behalf of juveniles and those with various mental handicaps in the justice system. Stevenson makes it personal by telling one main overarching story that is just makes you shake your head because you know that this stuff just can't be made up! At once heartbreaking, somehow the book doesn't bring you down, but makes you see the hope. A good book about study methods that take you from reading the Bible at the surface level or through a lens of emotion and "what it means to me" to historical context and meaning. This is a great "discussion" book. I went back and forth between 3 or 4 starts but finally landed on 4 because it was so thought-provoking, although I found her tone a little condescending at times. There was much I agreed with and much I did not agree with too. A full review can be read here. I had NEVER heard of Alice Seeley Harris before this book, which is too bad. Alice was a missionary to the Congo who soon discovered the atrocities of the rubber trade, which mutilated, maimed, and murdered the indigenous people of Congo for the harvest of rubber under the rule of Belgian King Leopold. She began documenting what she saw with her Brownie Kodak camera and eventually used her slides as evidence to crusade against the Belgian government alongside her husband. I was fascinated by Alice as a person and the tensions in her life. One of the biggest tensions was that of mother and missionary. To be an effective missionary as well as to go on a speaking tour to raise awareness to the Congo atrocities, she had to leave her own children behind for years to be cared for by others. Alice was a woman ahead of her time and more of us should know about who had a heart for social justice. A unique devotional guide literary types would appreciate. A great study that I did over the summer with some friends. I loved this book and it's so unique. You can read my complete review here. I love Ann Voskamp's heart and writing. She is so genuine in her faith. However, I had a hard time with this book. I had a hard time tracking with it and it felt scattered. Although each chapter holds is about the "brokenness" theme, I had a hard time following what the point was, most of the time. Each chapter seemed more like a stand alone narrative essay and I think I was looking for more of a narrative arc in the book overall. So as a whole, I found it a scattered reading that lacked cohesion. I did find gems and nuggets of wisdom that I highlighted throughout. This book was a lot more fun that I imagined. It took a minute to get into the rhythm of Rollins "voice." It reads like a conversation with lots of dry wit and sarcasm. She makes fun of herself a lot but it's encouraging too. This was a reread for me but perfectly timed. I read it as I experienced severe anxiety for the first time in my life over a health issue. Reading this book felt like it literally physically bolstered me each day as many a topic it came back to again and again was fear. What was your favorite non-fiction read in 2017?